The Culinary Arts Institute at LCCC is lead by a team of chefs with global training, experience and expertise that spans the culinary industry. 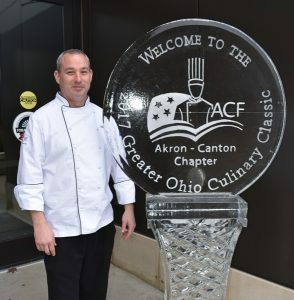 Chef Adam Schmith is Director of The Culinary Arts Institute for Lorain County Community College and the primary instructor for students enrolled in the culinary arts associate degree program. A graduate of Johnson & Wales University in Providence, Rhode Island and Cleveland, Ohio native, he joined the college in 2012. Through his career experiences he has developed extensive skills and techniques in a wide variety of cuisines from local to global influences. As a working chef, his resume includes top positions with the Ritz Carlton Hotel Company, premier restaurants, country clubs and resorts as well as a private chef for numerous celebrities. With a passion and focus on culinary education, he is the liaison with each individual that joins the culinary program and assists in guiding them through their development with Lorain County Community College. He is affiliated with the American Culinary Federation, Ohio Restaurant Association and various local and statewide vocational centers. Listen to Chef Adam Schmith’s interview about Sage & Seed on AM 930 on February 20, 2018.